Barry is in his seventies, deeply tanned neatly combed wavy grey hair, pressed bermuda shorts, trim navy polo shirt, and with a preference for that particular kind of white jogging shoe that looks brand new and seems to be all the go for his set, wearing after shave reeking of grey nomad. For twenty kilometres or so coming into Maryborough we followed him and his late model Japanese saloon, the kind that in the old days would have had a “Special” badge, but now is more likely to have been an “LS” or “Turbo Injected V6” and no doubt he finds it is the perfect tow vehicle for his caravan. It certainly had enough power, as it could pull the rig at 110 kph or more in the overtaking areas, although it always slowed to 87 in places where overtaking was impossible. 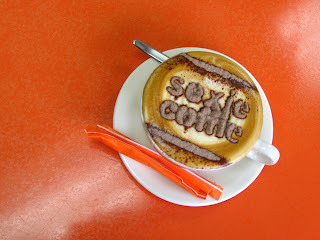 Even my almost inexhaustable patience was tested, but I knew that if I stayed calm, I would soon be able to pull over for a break at Sexie Coffie. Barry had the same idea, no doubt with courtesy in mind, to let me and the procession of other vehicles pass him. After refreshments, feeling suitably relaxed, I retired to powder my nose only to find him leaving the rest-room at the same time. He held the door for me as I entered. “Thanks Barry” I offered in my cheeriest tone. “Not really,” I replied, but his look gave me the impression that he wasn’t entirely satisfied with my answer. “I’m a tax investigator,” I offered without further explanation, before scuttling into my cubicle, leaving a perplexed Barry consider what that might have meant, and how the heck I knew who he was. When we left, Barry was speaking with his wife in hushed tones, hopefully vowing never to speed up in an overtaking lane again. I guess if I was to give any advice to Barry apart from the bit about not speeding up in the overtaking lanes, it would be if you do, don’t order coffee at one of those places where the girl is going to call out “Barry your coffee’s ready”, if you don’t want everyone to know your name. Ever tried the strip teas? As far as towing vans goes I think I may be Barry's love child. Never tried the teas, but the coffee is the best you'll ever get on a highway anywhere in the world. High praise indeed. but driving past Maryborough without stopping for a Sexie Coffie would be like going to Church without taking money for the collection! As far as towing the van goes, I know where you live!